Herds have come down from high pastures and are getting ready for winter. Climate negotiations have been held in Paris, with outcomes predicted to be insufficient to keep global warming under dangerous levels. Dryer weather, more frequent droughts, disruption of ecosystems are already real. Farmers around the world are the first affected by a warmer weather on Earth. Whereas agribusinesses have a strong responsibility in greenhouse gas emissions due to intensive farming and chemical inputs, agro-pastoralism is a way forward for a climate-friendly agriculture that can feed everyone while respecting the environment. Enough with the dead-end of productivism! 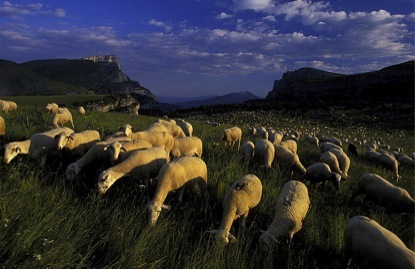 Transhumance, nomadism, extensive livestock farming are not only a sustainable practice, they represent a diversity of cultures and immemorial traditions around the globe. In these times of inward-looking extremisms, pastoralists offer an understanding of the world based on values of openness, adaptability and symbiotic relationship with nature. This is why ESN campaigns for the preservation of pastoralism and the shepherd way of life, in Europe and also globally as the regional chapter of the World Alliance of Mobile Indigenous People (WAMIP). Following the action plan decided by our member organizations last June in Koblenz, we are working towards an international meeting on predation in 2016. For now, here are some of autumn’s pastoralist news. ESN member Bundesverband Berufsschäfer (BVBS) organized a workshop “Fences against Wolves” on October 10 in Bettenfeld, Rhineland-Palatinate. Participating shepherds intensively discussed the topic of the wolf and Wolf Management Plan in Germany, which establishes the provision of funds for protective measures and compensation in areas where the presence of wolves is recognized. In a public statement, BVBS declared that “wolf populations in Europe have recovered to an extent where this species is no longer threatened with extinction, thus wolves should no longer be covered by the international protection convention”. Although the management plan has already made provisions for the removal of wolves that repeatedly approach settlements or kindergartens, BVBS warns that “in any case it must be avoided to tame or feed wolves as they may lose their fear of people”. Cross-breeding hybrid wolves must be prevented. The consequences of such trafficking are absolutely not to be overlooked. In November the International Centre for Reindeer Husbandry (ICR) and the Association of World Reindeer Herders (WRH) celebrated their anniversary in Yakutsk – 10 years for the ICR and 25 years for WRH. The celebration included a seminar and part of the ICR and WRH team traveling to Cherskiy, a small village in the Sakha Republic in the Northeast of Russia , hile there, there will be meetings with the Arctic College, to meet with reindeer herders and a week long focus on traditional food in relation to the EALLU project. The EALLU project “Reindeer Herding Youth, Adaptation to Climate Change and Food Culture” has been endorsed by the Arctic Council Sustainable Development Working Group at the end of the Canadian chairmanship in 2015. EALLU is a Sámi word that translates into English as ‘herd’. The goal of the EALLU project is to investigate reindeer herders’ food culture through the lens of traditional knowledge, adaptation to climate change and youth and EALLU combines academic work, education, seminars, food culture across Eurasia. It relies on the idea that young indigenous involvement and traditional knowledge are essential to a sustainable future in the Arctic. Following a petition pushed by ESN member FEP (Spanish Federation of Shepherds) to keep grazed wood pastures eligible for CAP support, a comprehensive report has now been jointly published by the Spanish Platform for Extensive Herding and Pastoralism and the European Forum on Nature Conservation and Pastoralism (EFNCP), that refutes the arguments used by European auditors and Spanish authorities to limit payments for these surfaces. Thousands of Spanish farmers have been facing reduced or canceled payments for eligible pastures that have been used for years. The unilateral decision from Spanish authorities stemmed from inspections of the European Commission, which for several years has asked for the reduction of direct payments under the first pillar of the CAP to those pastures with greater presence of trees and shrubs. To cope with the sanctions imposed by the Commission, Spain is drastically restricting eligibility of wood pastures grasses. The “Report on eligibility for direct payments from CAP of the Spanish wood pastures” questions the technical and scientific basis of these decisions. It also reveals that the exclusion of wood pastures does not conform to the new European regulations, since they only clearly exclude payments for ungrazed pastures. Earlier this year, the strong mobilization of grassroots pastoralists organizations such as FEP had led to a petition signed by 60 organizations to the Director General of Agriculture of the European Commission, Jerzy Bogdan Plewa, to inform him on the problems caused by his auditors. In a recent press release following the visit of Mongolia’s president Tsakhia Elbegdorj in November in France, Bernard Vallat, the Director General of the World Organization for Animal Health (OIE) has declared that the OIE would commit to support the improvement of veterinary services and the protection of pastoralism in the country by way of a high-level Conference on Pastoralism and Nomadic Civilizations in 2016, under the President of Mongolia’s and OIE’s patronage. Mongolia has a strong pastoral tradition. Its traditional farming communities have developed an immensely complex body of knowledge on how to manage their livestock (primarily yack). Today, this way of life is under threat from the same risks which pastoralism faces in all regions of the world. A key objective of the agreement is to support the resilience of Mongolian pastoral communities and their traditional knowledge, which forms part of humanity’s heritage, through improved animal health care.